Camp where Butch Cassidy and his gang used to hide! Hideout Canyon is surrounded by scenic cliffs; characteristic of the stunning Flaming Gorge area. 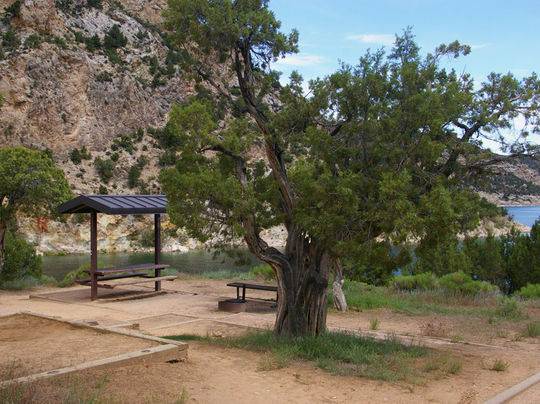 The campground is forested with pinyon pine and juniper, which offer only limited shade. Partial views of the reservoir are available from most of the 18 campsites. The gravel trails from the docks to the campsites are steep and change each year depending on water fluctuations. Lucerne Valley Marina is a few miles away by boat, where gas, boat slips, fishing licenses, bait and groceries are available at the small general store. Enjoy our virtual tour of Hideout Canyon Campground below then follow the link to explore more camping on Flaming Gorge.